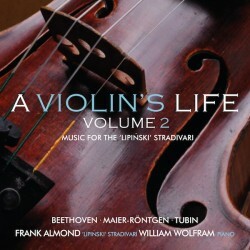 I had always hoped that A Violin’s Life would eventually be a multi-volume project, but also understood that would depend on a number of factors. The 2013 release was received with much enthusiasm, certainly far more than I’d anticipated; I immediately began thinking of repertory for Volume 2, and perhaps even beyond. The events of January 2014 simultaneously curtailed and accelerated those plans. As my life turned upside down within a few hours, it was difficult to imagine ever even seeing the Lipiński again, let alone playing it. Miraculously, ten days later it was back in my hands, relatively unscathed. Amid a media frenzy and lots of new security protocols, I was determined to finish what had already looked to be a busy season, but was so physically and psychologically exhausted that another recording project was out of the question. A few months later I’d planned it all out, but as usual there were a lot of moving parts to the puzzle, and I was still navigating the legal issues related to the theft until February 2015. Nevertheless, I was stubbornly resolute that we’d do another volume (hopefully during the 300th anniversary season), then maybe send signed copies to two guys in prison. The Violin Sonata of Amanda Maier-Röntgen was a revelatory discovery in my research back in 2013, and it is immensely satisfying to include it on this recording. Further, I’m thrilled that the illustrious and much-admired Emily Hogstad contributed this wonderful essay on a composer who lingers in unjust obscurity. The composer Eduard Tubin came to Amanda Maier-Röntgen’s native Sweden as a refugee, fleeing the various invasions of his native Estonia in 1944. The powerful solo sonata dates from 1962; his works were often programmed by the Estonian violinist Evi Liivak, who played on the Lipiński from 1962 until her retirement in the late 1980s. As musician members of the Estonian diaspora created by the war, they were surely acquainted. We’ve managed to include a compelling article on this prolific and fascinating composer, also inexplicably remaining on the periphery of mainstream repertory despite the efforts of the eminent Neeme Järvi, who has boldly championed Tubin’s symphonies (all 10 of them). Beethoven’s iconic Kreutzer sonata speaks for itself, in all its fantastic glory. Back in 2013 I discovered that Karol Lipiński included it during some concerts in Dresden in 1840 playing this violin; Franz Liszt was the pianist. So here it is, hopefully some kind of tribute to the survival of great music played on a great work of art, even amid events no one could have possibly imagined back when I started this endeavor in 2012. I am of course quite relieved to be alive and still playing this superb violin, and my gratitude has only increased throughout the challenges and triumphs of the past two years. Many thanks again to all that have continued their unwavering support and enthusiasm for my various activities, including this latest project. I’ve been listening to the new CD at work since I got it in the mail from the Kickstarter project and I’ve had many people stop by my desk and comment on how beautiful the music is that I’m listening to. Thanks for making it possible through KS. Agreed this recording sounds especially good in the workplace…..